The Greek Gods are alive! And Mount Olympus is just an elevator ride inside New York’s Empire State Building. This is the premise of the fantasy series, Percy Jackson and the Olympians, which was written by Rick Riordan and published by Hyperion Books. 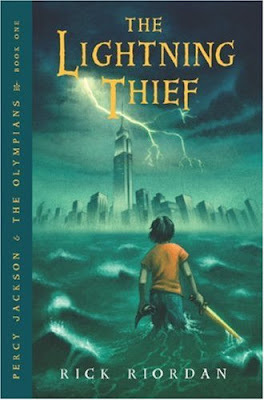 Percy Jackson and the Olympians, follows the story of Percy Jackson, the demigod son of Poseidon. Just like the Greek heroes of old, Percy Jackson was involved in various quests, specifically, the quests to avoid the rise to power of Kronos and the Titans. In the first book, Percy Jackson thwarted the plan of Cronos to get the master bolt of Zeus. In the next books of the series, Percy and other demigods are fighting against the plans of Cronos and prevent the return of the deposed Titans to power. I liked the first book because of its many allusions of the elements of the Greek myths. I specifically liked the part where Percy and his quest mates went down to Hades. I like how Charon was characterized and the continued swelling of Hades’ population, especially the increase of the underworld god Hades’ problem of managing the overpopulated realm. However, I disagree with the hailing of this series as the next to Harry Potter series. My main reason for this is that Rick Riordan’s work is stale as compared to J.K. Rowling’s masterpieces. There is also a problem of the reliance on “deus ex machina” on the next books of the series. Percy Jackson and the Olympians is a popular book, however, it fall short that’s why I can’t consider the series as a masterpiece. Visit Before the Eastern Sunset and read about my visit to Manila Ocean Park's Jellyfish attraction. Also drop by Cyber Imprints and read when Facebook will shut down.